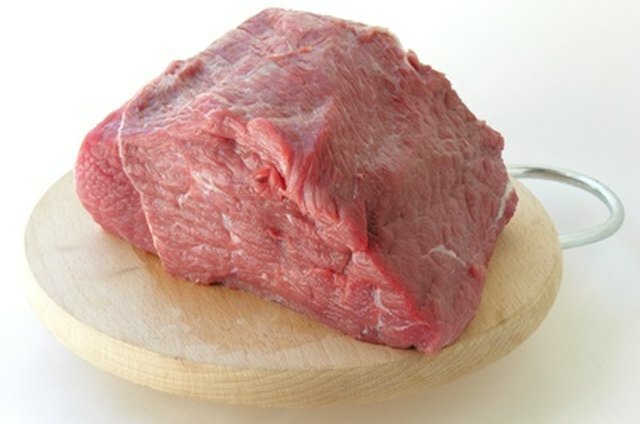 The eye of round is a cut of beef that comes from the rear end of the cow and is generally reserved for stews and roasts because of its tougher texture and sinewy meat. When cooked properly, the eye of round produces hearty, flavorful meat that lends itself well to heavy dishes. 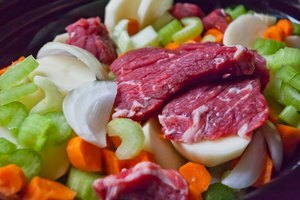 However, when eye of round is not available, there are a few other beef cuts that can take its place in the slow cooker and provide the same savory flavor. 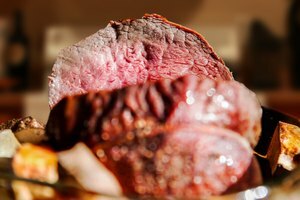 Beef rump is also carved from the rear of the cow's carcass, giving it a tougher texture than meat culled from the front. However, the rump is located higher in the round and closer to the sirloin (the steak area of the cow), giving it a flavor slightly more rich than other round cuts. Still a good roasting or slow-cooking cut of meat, the rump can do any dish that calls for eye of round. 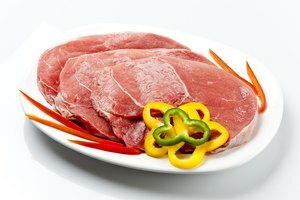 The rump can also be cut into steaks or used in ground beef and comes in standard, choice and prime grades, denoting the quality of flavor and tenderness of the meat. Bottom round is another cut from the back of the animal and is actually the larger portion of eye of round. With the eye of round removed (the tenderest part of the bottom round cut), bottom round can be sold as heel, flat, round steak or just beef bottom round. Slightly tougher and more sinewy than eye of round, bottom round can be used in most eye of round dishes that call for the moist heat of slow cooking and braising. The meat is savory when cooked properly and is easily spiced up in a slow cooked stew, soup, curry or roast. Arm and shoulder cuts are chuck cuts, processed from the front of the cow, in the area of the upper front legs and the neck. They can substitute for eye of round because they, too, have tougher textures and lots of connective tissue. However, cuts from the chuck portion of the cow are generally cheaper and can have more flavor. An arm and shoulder roast are located directly next to one another and can serve in any slow-roasting or braising culinary application. Cubed or stewed arm roast works well in soups and sauces while shoulder cuts should be braised, marinated or slow-roasted in liquid because they can be quite tough. Chet Carrie has been writing since 2004. He served as an editor for a university magazine and has freelanced for several newspapers. Carrie holds a Bachelor of Arts in English. What Cut of Beef Is the Peeled Knuckle?